We all like to have pets around the house. Keeping pets such as cats requires you to understand the basic schedule of the pet. In particular, you need to understand your pet’s feeding schedule since it can’t fend for itself while living in your house. Once you know what you need to feed your pet, then your next task is to find out when to feed it. In many cases, the pet will need to be fed at times when you are not even around the house. That is where the PetSafe Healthy Pet Simply Feed automatic feeder comes in handy. The PetSafe Healthy Pet Simply Feed auto cat feeder is a worthwhile investment when it comes to your pet’s feeding and health. It doesn’t matter whether you are home or away, or even just asleep at home- this timed cat feeder will make sure your cats and dogs get their portions of food at appropriate times. 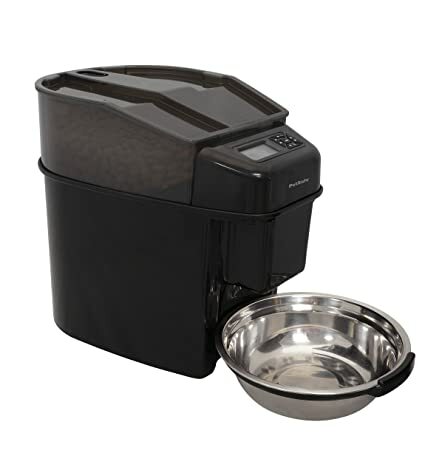 You can customize the feeder to serve your pet’s portions for up to 12 times a day. The feeder serves dry or semi- moist food to your pet in portions that can range from an eighth of a cup to four cups in quantity. Depending on how you like to serve your pet, you can also customize the rate at which each portion is served to your pet. With the ‘slow feed’ option, each of your pet’s portions will be served over a period of 15 minutes. The slow feed mode is meant to prevent your cat or dog from eating too fast, gulping the food or vomiting. If you like your pet to have its meals fast, you can choose immediate feed, which means that each of the portions will be dispensed at once. You can also stop the feeding schedule for some time by selecting the ‘pause feed’ mode. Your pet’s feeding schedule will be resumed once you exit this mode. You can store up to 24 cups of food in this feeder, and since it is stored in a translucent hopper, you can always know when to refill your pet’s supplies. It will help you feed your pet with a consistent schedule, whether or not you are available. Feeding programs can be customized to your preference. The feeder is easy to wash since it can disassemble quite simply. The feeding bowl comes with a holder which makes it steady. It won’t move even if your pet tries to push it. PetSafe is a reputable company, having produced pet products since 1991. With this automatic feeder, your cats and dogs will not be able to access the food before the pre-scheduled feeding times. The design of the feeder is pretty solid and your pet can’t knock it over. Also, as long as you don’t open the lid, your pet will not try to get to the food since it will not be able to smell it through the plastic. The feeding bowl is made of stainless steel, which is more hygienic than a plastic bowl. You can manage your pet’s weight by limiting the amount of food it consumes in a day. This can still be done manually, but it is much easier to regulate your pet’s eating with an automatic feeder. The food stays fresh for a long period of time. You should always remember to close the lid. It can’t be used with large dogs. The whole feeder is designed for cats and small dogs. If you used it to feed a large dog, the hopper would get emptied too fast, and the dog can even knock the feeder over. A large dog can also not eat out of the small feeding bowl- you would have to refill it a couple of times in each feeding period. The feeding bowl is deep, and, of course, is positioned directly under the dispenser. This means that food will pile, and your pet might not have the intelligence to just take small portions of food at a go. This might make it get sick. Also, being so deep, your pet might find it an inconvenience to get to the food. It is harder to use for more than one pet, especially if there is some aggression between the pets. First, you shouldn’t expect the feeder to dispense food the first time you use it. In fact, it probably will not dispense food even the second and the third time. But this shouldn’t worry you. You can always feed your pet manually till the dispenser starts to work. This is also not a malfunction. The conveyor belt simply needs time to fill each slot with food. Normally, the feeder will dispense food by the fourth feeding. Another important thing to remember is to always align the conveyor belt correctly. Otherwise, the dispenser may fail to serve the correct amount of food to your pet. You might also experience trouble with the deep feeding bowl. This can be simply solved by replacing it with a bowl that is more flat, and manually having it tied to the feeder. If your pet gulps food because of the food piling on the bowl, you can also reduce the amount of food served at each period, and increase the number of eating sessions. Also, choosing the slow feed mode can help reduce the chances of your pet taking in large amounts of food at once. With this feeder, you might have to go through the manual once or twice since programming it is not something you would know from previous experiences with devices. With that said, operating the feeder is quite simple once you know how to do it. Just don’t throw the manual away till you are confident in your ability to use the feeder. PetSafe Healthy Pet Simply Feed is among the best automatic cat feeders out there. If you keep a cat or a small/ medium-sized dog at home, we would recommend that you consider using this automatic pet feeder to feed your pets.